A simple reminder of upcoming events will keep you in track. 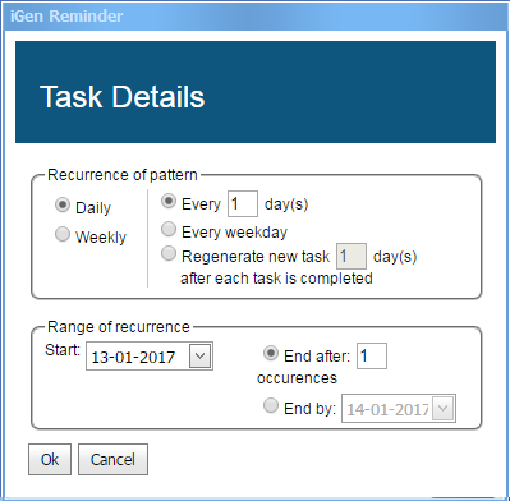 We have taken the pleasure of incorporating such feature in iGen, where easy and simple steps to add and maintain the remainders. You can configure the Remainders from the System Settings with the list of options. To ease the view and also control what you need to see. You can launch the Remainder from the Utility Module.. Task appearance can be chosen using option Title/Content Only/Title with Content. Future and Expire Job Show List applies only for Not Completed Tasks. 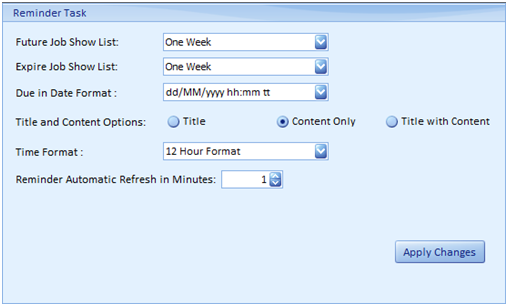 Date format given changes the format in task due time. If no action taken against reminder, it will reappear in Automatic Refresh interval. Simple, type and create feature for a new Task to remind you for. 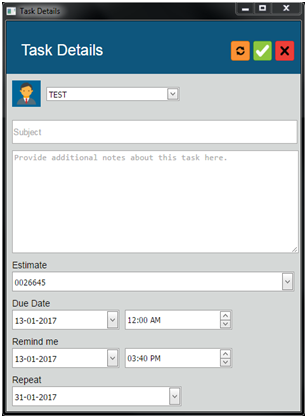 Type the Task subject in Text box available in Not completed Screen and Press Enter. New task would be created today with typed subject, Click on the Subject to open the Task.